you can’t jump out; you must remain. My Dad always had the radio or records playing; anything opera or classic, except Bach. Problem 103 was knocking on her front door. 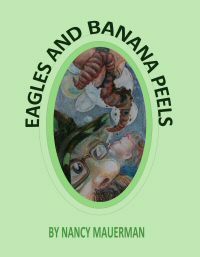 My book ‘Eagles And Banana Peels’ is free this weekend! My black cat, Tesula often walks like a camel, both right legs going forward, both left legs back but my other cat, Formica Dinette Patrice Foxford Mauerman walks normally.